Recent posts show Buster Keaton crossed paths with Orson Welles in Venice, California (The High Sign and Touch of Evil), and with Alfred Hitchcock in San Francisco (Day Dreams and Vertigo). This time Keaton and ‘King of Cool’ actor Steve McQueen cross paths filming stunts in the City by the Bay. Click to enlarge – different actors, different stunts. Keaton falls from a cable car, while McQueen races his Mustang – matching views from Day Dreams and Bullitt. The church spires don’t appear below in this 1922 Day Dreams view north at Washington and Powell (visible at back in the modern view) for the same reason. 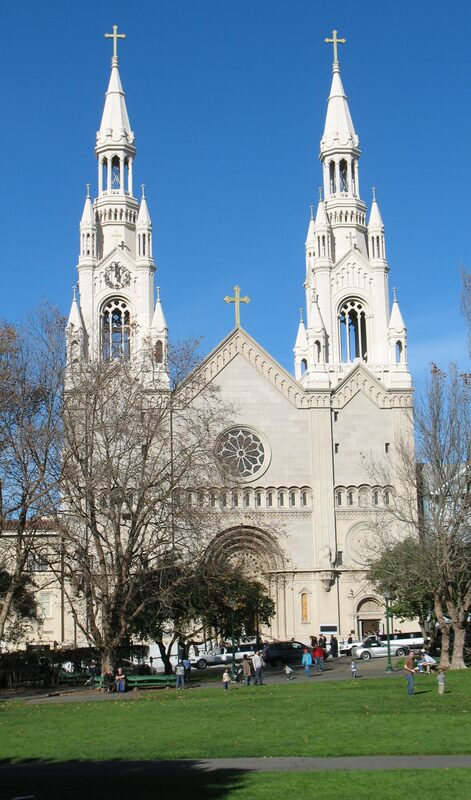 Washington and Powell today – the Saints Peter and Paul spires peek out at in the far distance. 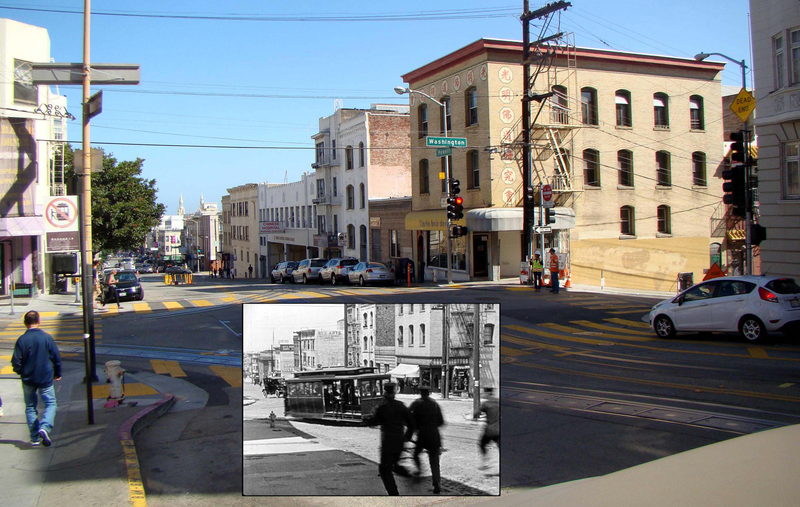 Skip also found a three-way Keaton/Hitchcock/McQueen connection, as Jimmy Stewart’s apartment in Vertigo (1958) stands at the corner of Lombard and Jones, overlooking the block of Lombard to the east where Keaton flees an army of police in Day Dreams. 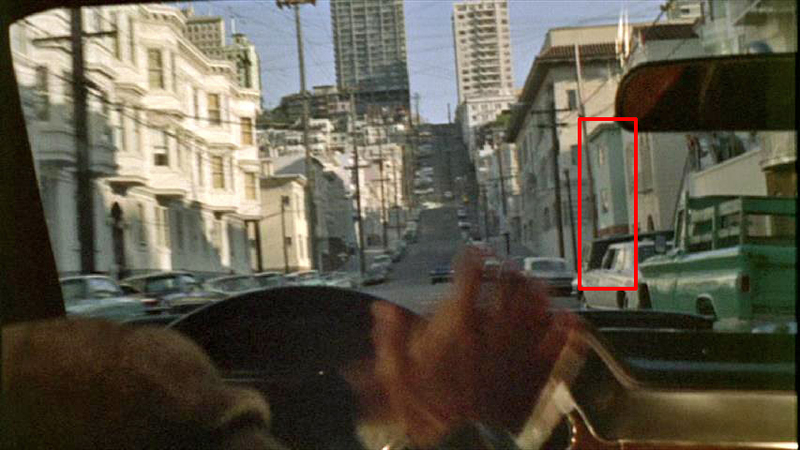 During the Bullitt chase, McQueen drives south down Jones towards the corner of Lombard, with Stewart’s apartment (red box above) appearing to the right. During the thrilling car chase in Bullitt, Steve McQueen drives south down Jones towards Jimmy Stewart’s corner Vertigo apartment on Lombard (box). 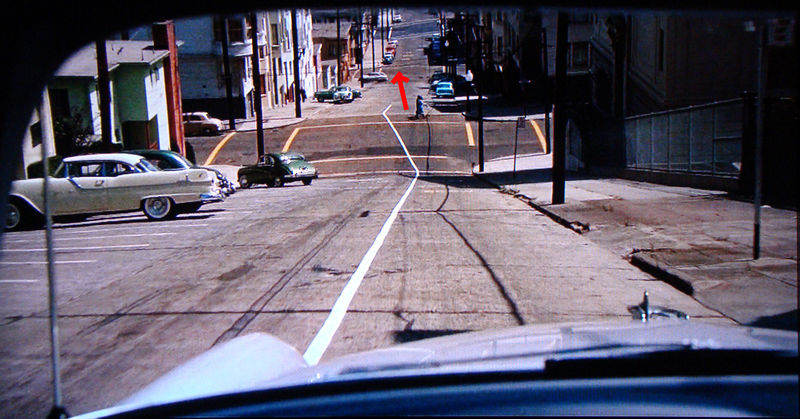 From Vertigo, a view east down Lombard, and the block Buster fled (arrow) in Day Dreams. In the Bullitt scene above, McQueen drives left to right along Jones past Jimmy Stewart’s red chimney apartment on the left corner. Read more about Keaton and Vertigo HERE. 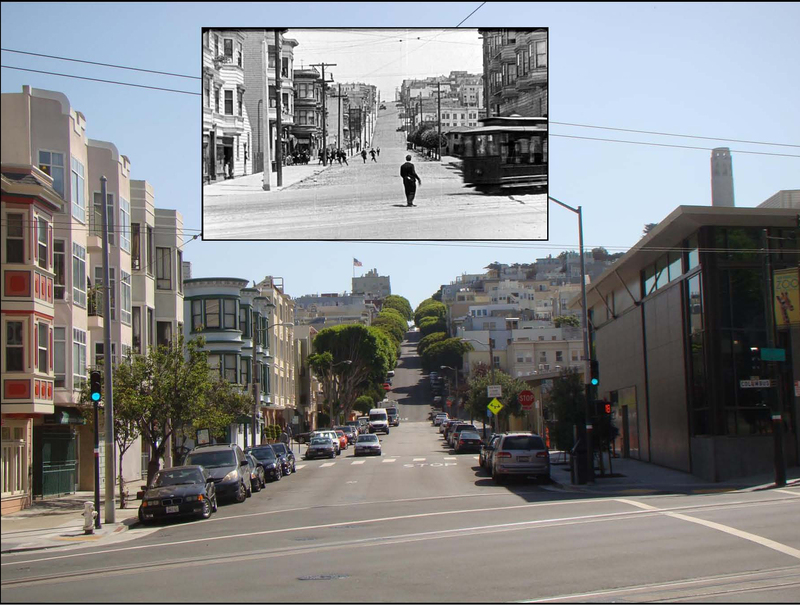 Matching views east along Lombard from Columbus (look at all the available parking in 1922!). 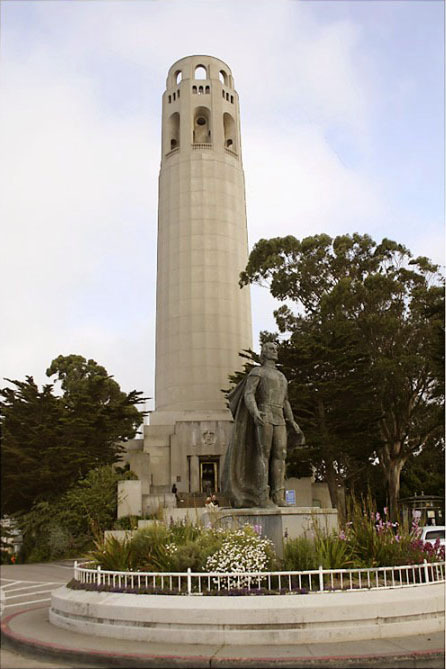 Coit Tower was completed in 1933. Skip, who lives in Illinois, also ingeniously discovered the Safety Last! 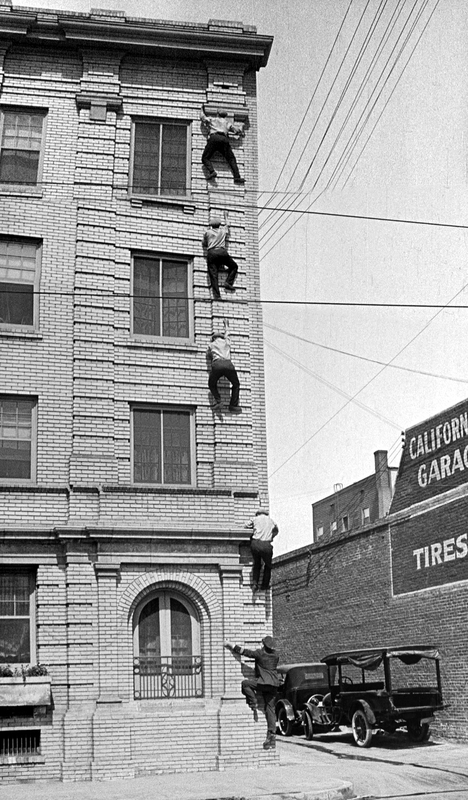 mystery building (the Dresden Apartments, 1919 W 7th Street), the still standing 4 story building human spider Bill Strother climbs early in the movie – read HERE). You can download a PDF tour of all of Keaton’s San Francisco filming locations HERE. For anyone interested in reading more about the famous Bullitt and Vertigo filming locations, I highly recommend the entertaining and meticulous classic-era San Francisco movie location blog ReelSF. You’ll find a full breakdown of Bullitt HERE, and a full breakdown of Vertigo HERE. Today the Transamerica Pyramid looms at back over Columbus Avenue. This entry was posted in Buster Keaton, San Francisco and tagged Alfred Hitchcock, Bullitt, Buster Keaton, San Francisco then and now, Silent Comedians, Silent Comedies, Silent Movie Locations, Steve McQueen, then and now, Vertigo. Bookmark the permalink. This is particularly relevant with the recent discovery of the original Bullitt Mustang in a Mexican junkyard. Serial number proves it to be the second of two identical Mustangs ordered by Warner Bros. for the movie. This one, long thought to have been lost, has reappeared to the delight of car enthusiasts everywhere, only months before the 50th anniversary of the movie. Just like a Hollywood story! Wonderful post and great work! Steve McQueen walked onto my elevator step at a theatre off Van Ness right after Saturday Night Fever opened. I had just seen the matinee. “How’d ya like the show?” he asked. “I thought it was terrific. John Travolta is a great dancer. He’ll be a star. Steve McQueen, right?” I asked as I looked to the right. “Yep” he said. We both reached the ground floor. He went to meet his last wife, waiting for him. I turned left to take Cable Car home to Golden Gateway Center.